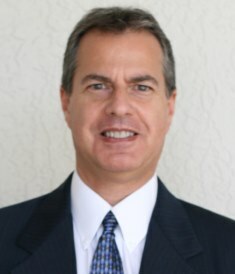 I’m a Senior Product Manager in our Connected LTE line of business and work at our headquarters in Tampa. I joined Syniverse as a Product Manager nearly three years ago, and have spent all my time in the Connected LTE line of business. During my tenure, I’ve worked on multiple products and projects, including Voice over LTE (VoLTE) interconnect and roaming service initiatives, as well as IP Multimedia Subsystem (IMS) services. Our VoLTE services offer mobile operators a new level of efficiency and innovation for voice calls by enabling once-dedicated voice networks to be shared for both data and high-quality IP-based voice calls. And our IMS services address a critical need for operators by helping them more quickly and cost-efficiently implement and interconnect IMS-based services, like VoLTE, with an extremely versatile, open-standards-based architectural framework. I’m currently involved in working with a team to develop a new secure network and related services. This involves reaching out to various Syniverse teams to ensure we accurately describe end-to-end process flows, develop proper service requirements (operations and business support systems), and capture information for teams to draft proper methods and procedures. I’m also creating and posting materials to assist with the positioning and sale of the service. Mobile is pervasive, and it’s a growing necessity in our personal and corporate lives. At the same time, there’s an increasing desire to connect and automate the world we live in (think IoT and autonomous services). Following from this, I joined Syniverse with a goal of expanding my product knowledge beyond wired networks, enterprise applications, and managed services, and I’ve been fortunate to achieve this goal while contributing to the development of some of our more advanced services, like VoLTE and RCS. I’ve had a chance to work on multiple Syniverse products in less than three years – each one more complex than the one before! Being able to have this flexibility to move from one product to another, be faced with new challenges, and gain different expertise creates a refreshed and renewed interest in the job and fuels my passion to succeed. Two things really. First, for work to be fun, you must enjoy relationships with those around you. Second, you must be energized by the work you do. I’ve always felt very welcome at Syniverse. I enjoy the friendliness and cooperative nature, and the people and the relationships. I think the company does a great job in trying to foster a friendly atmosphere through our Employee Association activities and similar employee-appreciation events. Beyond people and our working environment, I appreciate our current corporate vision and my assignment to new and exciting services that will drive Syniverse forward as a leader in mobile. Unlike my Apple-oriented children, I’m an Android fan. I use a Galaxy S6, but it may be time for an upgrade. I’ve been impressed with the improvements made with the Galaxy S8 and am waiting to see how the S9 stacks up. I have several favorite apps that help me to keep in touch with friends and family. My favorite non-communication app is Vera Mobile. Wanting to learn firsthand about the internet of things, I installed a Vera home automation system to control my home door locks, thermostats, lights and more. It’s not only convenient, but helps us to better secure our home. The app makes it easy to check and change the status of door locks and other controlled devices, and it confirms everything is OK while I’m away! As a parent, I always want to have my phone nearby. However, I’ve gone a full day without my phone during vacations when we travel together as a family. Unplugging for a short time is not a bad thing! 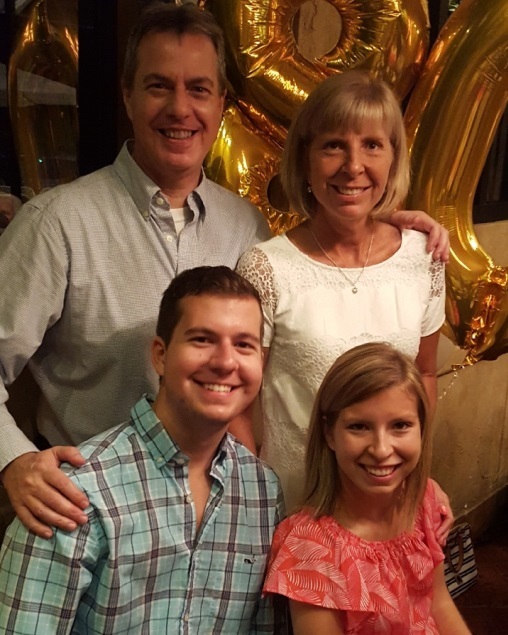 I love spending time with friends and family, which include my wife, Karen; my daughter, Sarah; and my son, Brandon. Beyond my family time, I enjoy participating in programs focused on assisting those with disabilities. 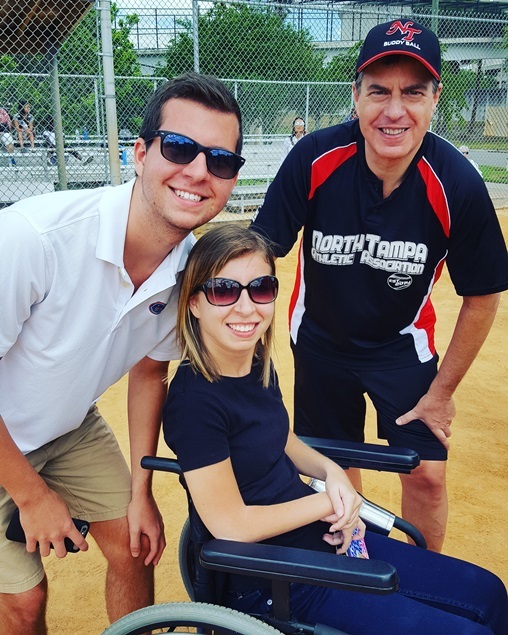 As part of this, I coach a Buddy Ball team that enables children with disabilities to play baseball with their peers. I also had the privilege of being appointed by Florida’s governor, Rick Scott, to serve as a board member of The Able Trust organization. The Able Trust’s mission is to work with state agencies and private resources to help Floridians with disabilities secure meaningful employment. This is accomplished through youth leadership events, high school technical programs, grants that support training and internships, as well as other programs supporting the disability community. These are amazing programs, and I’m so fortunate to be able to contribute to these organizations. My son and daughter assist me at a Buddy Ball game. 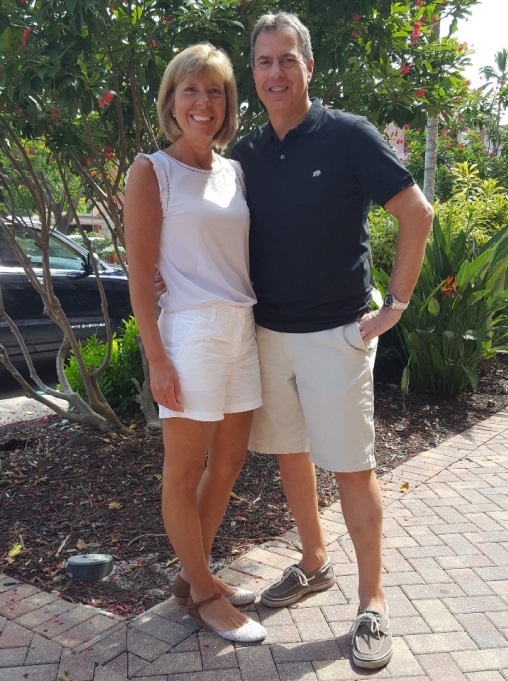 My wife and me in Naples, Florida.